1971 - The Jackson 5 attend the Salute to Muhammad Ali charity held at Hollywood Palladium, to raise money for the Los Angeles Brotherhood Crusade. 1973 - The song Melodie was recorded by Michael Jackson, but it remained unreleased until it appeared – newly mixed – on Michael's album, FAREWELL MY SUMMER LOVE. 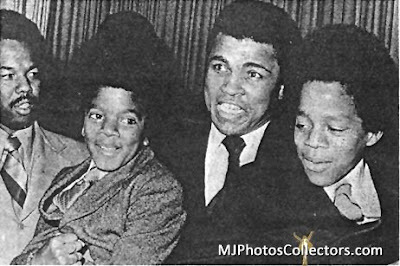 1976 - Michael and his brothers all gave sworn depositions in the Jackson 5′s counter-suit against Motown records. Recounting his private meeting with Berry Gordy nine months earlier, he described it as one of the most difficult things he had ever done in his life. 1997 - Michael stayed two weeks in the Tower Suite at the Montreux Palace in Montreux, Switzerland to complete work on his album Blood On The Dance Floor. Every day, he went to the Mountain Studios where he recorded the album. No way for him to pass by incognito, in his big limousine, surrounded by body guards! The King of pop music liked Switzerland for having there all the calmness he needed for the recording of part of his album Blood on the Dance Floor. The album was produced while Michael traveled the globe on his HIStory World Tour. Thus, the songs were produced in a variety of countries that included Sweden, Switzerland and Germany. After a divorce and a re-marriage, Michael records Blood on the Dance floor in the Mountain Studios in Montreux. It was the calm of this city which decided Michael Jackson to come and work in Montreux. 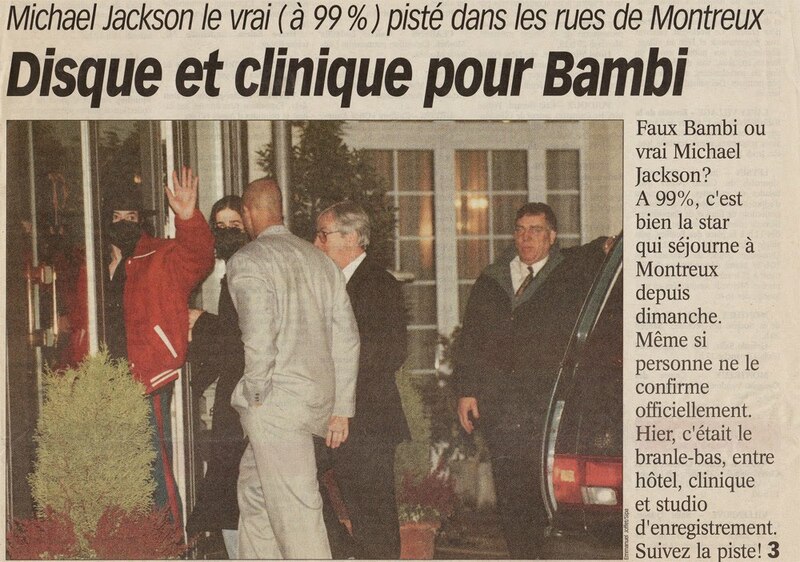 The news of Michael's presence in town was spread out very quickly, and fans from all over Europe came to Montreux: They tried to see him day and night, gathering at the entrance of Montreux Palace and desperately hoping for a photo or an autograph, or just to see him. But Michael often used hidden doors or accesses for employees and soon disappeared in a limousine with dark windows. During his stay in Montreux, Michael Jackson wanted to acquire the house owned by the Chaplin family, former long-time residence of Charlie Chaplin, but his offer to buy the property was declined by the heirs of the famous artist. 2003 - Michael pays a last respect to Bee Gee's Maurice Gibb. Gibb, 53, died on January 12 after suffering cardiac arrest shortly before undergoing emergency surgery on a blocked intestine. Gibb's private funeral was held at Riverside Gordon Memorial Chapel in Miami Beach at noon and was followed by a cremation service. The private funeral service for Maurice Gibb was attended by family and close friends, including his fraternal bandmates, twin brother Robin Gibb and Barry Gibb, Michael Jackson and Gibb's first wife, singer-actress Lulu. An hour after the official funeral Barry and Michael went to the coffin to honor Maurice for the last time. Michael was wearing a turquoise suit and went in quickly protected by a black umbrella to show his friend the last respect. Michael Jackson is a close friend of the Gibb family, and had been working on a song with the Bee Gees just prior to Maurice's sudden illness. This entry was posted on 15 January 2011 at Saturday, January 15, 2011 and is filed under 1971, 1973, 1976, 1997, 2003 . You can follow any responses to this entry through the comments feed .